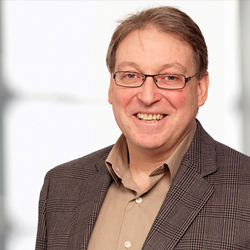 Dr. J. Paul Santerre is one of the world’s leading authorities in the area of polymer biodegradation studies and synthesis of polyurethane materials. He serves as a consultant for leading medical device manufacturers on material design and technical expertise in the field. His research program is focused on investigating the relationship between polymers and bio-degradation processes in the body in order to advance the design of new materials for tissue engineering, implants and medical devices. Prior to starting at U of T in 1993, Professor Santerre was the lead materials engineer on the artificial heart program at the University of Ottawa Heart Institute. At U of T, he served as co-director of CIHR’s training network for Network for Oral Research Training and Health (NORTH) and was Associate Dean, Research in the University of Toronto’s Faculty of Dentistry. Currently, Professor Santerre holds appointments as full professor in the Division of Biomaterials within the Faculty of Dentistry, the Institute of Biomaterials & Biomedical Engineering, Department of Chemical Engineering & Applied Chemistry and the Department of Materials Science & Engineering. Professor Santerre also founded a U of T biotech start-up company called Interface Biologics Inc, which develops catheters and drug-polymer coatings for medical devices. In 2004, Professor Santerre was inducted as a Fellow, Biomaterials Science and Engineering (FBSE) for lifetime achievement, and in 2009 became a Fellow of the American Institute for Medical and Biological Engineering. In March 2010, he received the Julia Levy Award from the Canadian Society for Chemical Industry for translation of knowledge to product, and most recently was appointed as a fellow of the American Association for the Advancement of Science. Professor Santerre has carried out work on more than 65 peer-reviewed, funded grants and contracts totaling more than $14M in research activity. His group has published more than 135 peer-reviewed papers in leading biomaterial and polymer journals which have generated 59 patents in the field of biomedical and membrane technologies.